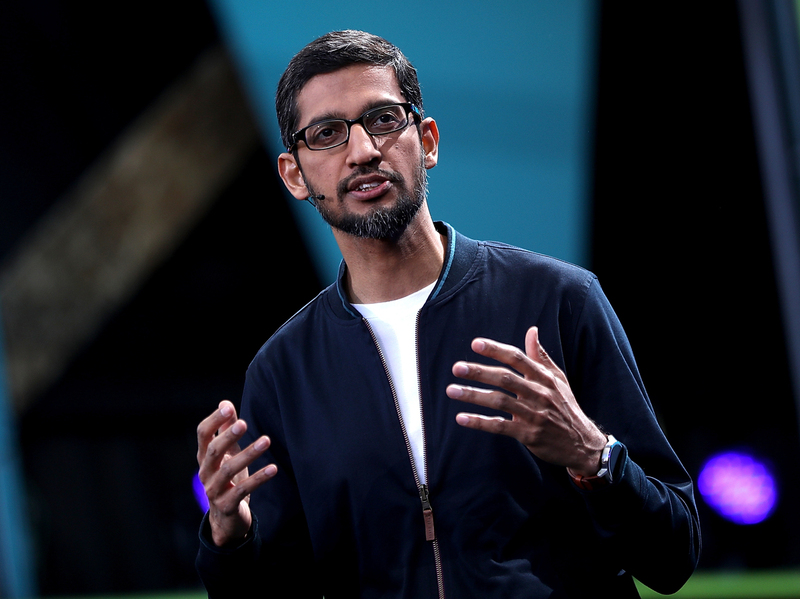 Google CEO Cuts Vacation Short To Deal With Crisis Over Diversity Memo : All Tech Considered CEO Sundar Pichai says that he supported the right of workers to express themselves but that a senior engineer's memo had gone too far. The memo's author says he is weighing legal action. Google CEO Sundar Pichai says that he supports the right of workers to express themselves but that a senior engineer's memo had gone too far. Google CEO Sundar Pichai cut his the vacation short and returned to the company's Mountain View, Calif., headquarters as criticism mounted over a senior engineer's controversial memo condemning Google's diversity initiatives. The engineer was subsequently fired. The memo, which some inside Google jokingly called a "manifesto," was widely shared inside and outside the company. James Damore wrote that "biological causes" are part of the reason women aren't represented equally in its tech departments and leadership. In addition, Damore said men have a "higher drive for status." Damore also criticized the company for being an "ideological echo chamber" that made it hard to dissent from "Google's left bias" and "politically correct monoculture." He also faulted the company for offering mentoring and other opportunities to its employees based on gender or race. "The memo has clearly impacted our co-workers, some of whom are hurting and feel judged based on their gender. Our co-workers shouldn't have to worry that each time they open their mouths to speak in a meeting, they have to prove that they are not like the memo states, being 'agreeable' rather than 'assertive,' showing a 'lower stress tolerance,' or being 'neurotic.' "
Pichai said portions of Damore's memo violate "our Code of Conduct and cross the line by advancing harmful gender stereotypes in our workplace." Pichai has scheduled an all-staff meeting to discuss the situation. In an email to The New York Times, Damore said he is likely to pursue legal action. "I have a legal right to express my concerns about the terms and conditions of my working environment and to bring up potentially illegal behavior, which is what my document does," Damore said. Meanwhile, social media continues to churn with tweets and posts on both sides of the issue. Conservative sites like The Federalist saw the firing as proof of Damore's point that Google does not tolerate diversity of opinion. However, former Google employee Kelly Ellis, who told NPR on Monday that she thought Google should fire Damore, sent out tweets supporting the decision. Ellis says she left Google because she was sexually harassed. Ellis said Google promotes employees and determines salaries based on peer evaluations. Therefore, she says, Damore's bias against women could harm female colleagues. Episode 787: Google Is Big. Is That Bad?